Birders take part in a bird walk led by the Fort Indiantown Gap (PA) wildlife staff, May 27, 2015. The beginning of a new year brings hope, the setting of resolutions—and a fresh opportunity to complete a Big Year. A Big Year, in birding parlance, can be either a formal or an informal challenge among birders to identify as many species as possible in a single calendar year. According to the American Birding Association, a Big Year officially begins at 12:00 AM on January 1st and ends at 11:59 PM on December 31st of that same year, based on the local time of the location of the birder at each time threshold. Tom Ford-Hutchinson (TFH), who accomplished a Big Year in 2013 in Orange County, California. Betty Glass (BG), who is running and promoting the Denver Audubon Big Year competition across six counties in Colorado. 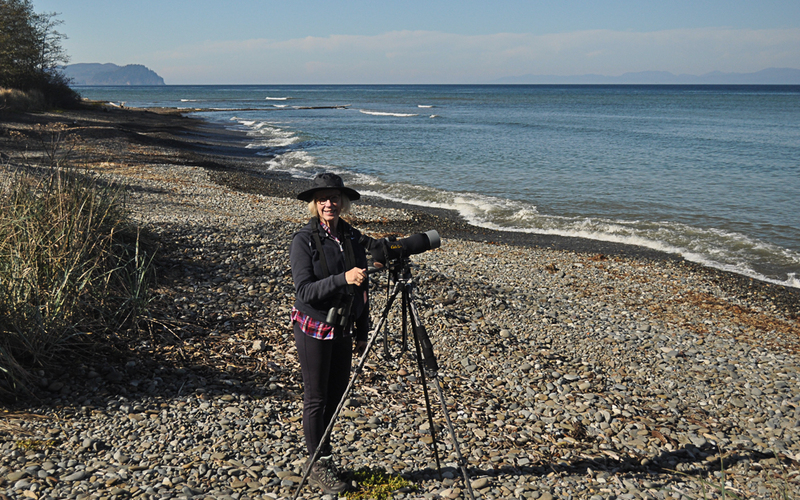 Aija Konrad (AK), who completed a Big Year in the lower 48 states in 2018 and spotted an astounding 577 species! You can view some of her husband Ed’s photos of her Big Year on Flickr. Aija Konrad chasing her Big Year along the Strait of Juan de Fuca in Washington. Why should somebody try to complete a Big Year? BG: If you can keep at it and commit for the full year, you will learn so much about birds, conservation, habitat, other species (mammals, insects, etc. ), and ecology. You will become a more involved and aware person. AK: Doing a Big Year was so rewarding and exciting! We never expected to get to 500 species and finished the year on New Year’s Eve in Portland, Maine, looking for a Great Black Hawk. We saw a lot of the country and visited 36 states and 35 national parks and wildlife refuges. TFH: That’s the million dollar question, and I feel like most people who have done one would say you shouldn’t, haha. There’s no prize or plaque at the end of it, so if you’re going do it, do it for yourself or use it to promote something you care about. What kind of time commitment is required for a successful Big Year? TFH: A big year is whatever you want to make of it and can be whatever sort of time commitment you want to make it. Proper planning and local knowledge can significantly decrease the amount of time you spend on it. In the end, I missed a bird because I went to Coachella for a weekend, and I was still working full-time. So you make it what it is. If you aren’t enjoying it, what’s the point? BG: If you want to win, you’ll be out birding every day. If you’re going to participate and learn more about birds in your area, you can go out two to three times a week, and you’ll be successful. You can also just watch your backyard every day. AK: It takes commitment, serious drive, and lots of time to do a national Big Year! And you have to be a little bit crazy. We ended up taking 10 major trips, drove 30,000 miles, flew many more, were away from home for 110 days. What essentials do birders need to have a successful Big Year? AK: Once we made the commitment, we looked up festivals and birding trips around the country. Ebird was our biggest source for what to go after. We would often recreate itineraries of tour companies. It also helps to have a partner—I could not have done it without my husband, who was as committed as I was. When we traveled, we would almost always bird from dawn to dusk. That was essential for making the most of our time. It was exhausting but exhilarating. BG: First of all, think about the birds you are likely to see nearby, find places in your county that you can find them, and research when they are likely to arrive in the area. The other part is to be aware of when new species come to the state and know where you can find rare species. The Denver Audubon Society is putting together resources that discuss 50 birds you can see without binoculars, 50 sights you might want to check out in the region, and 50 things you can do to make Denver more bird-friendly. Resources like these can help you plan your year. TFH: Equipment-wise, a good pair of binoculars goes a long way, as does some sort of digital camera to document your sightings. A good spotting scope (or a friend with one) can also be critical to find seabirds or shorebirds. The number one thing that birders to need to succeed in a Big Year, however, is an understanding of the status and distribution of species. This couldn’t be easier now with all the data available on eBird. Birding apps (like BirdsEye) can help someone discover what birds to look for during a specific week of the year based on previous records and/or bird sightings in surrounding counties. They can help you be in the right habitat to find them when they show up in your area. Also, being aware of the weather can also help you predict where and when to be somewhere. Lastly, the saying that the early bird gets the worm really is true—birds are most active from right before dawn to an hour after the sun rises. This is by far the easiest time to find most rarities as they search for food. What kinds of things to birders need to plan in preparation for a big year (timing, location, etc.)? TFH: Stakeout and find winter rarities early. Plan on May/June for Spring Migration, Late July/August for shorebirds, Late August/Sep/Oct for Fall migration, and December for anything that is found on the Christmas Bird Counts. BG: Right now (winter), get all the waterfowl. All the ducks are out and in breeding plumage and are easy to see. 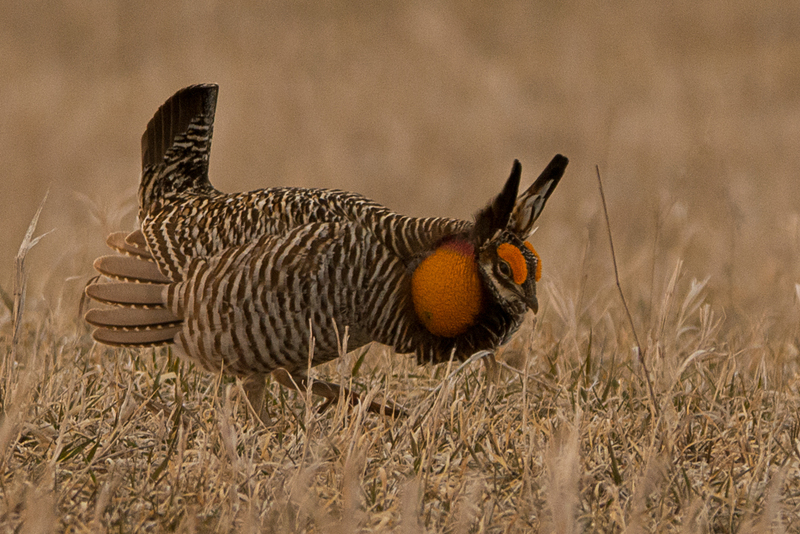 Get ready for spring migration, which starts the end of April and goes through the beginning of June (in Colorado). Summer is really great for breeding birds in Colorado because you see them in their nest, and see juveniles. Fall is the reverse migration—it is exciting because you see Alaskan birds in Denver sometimes. 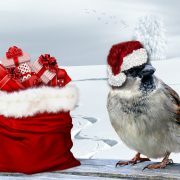 Participate in a Christmas Bird Count toward the end of the year. 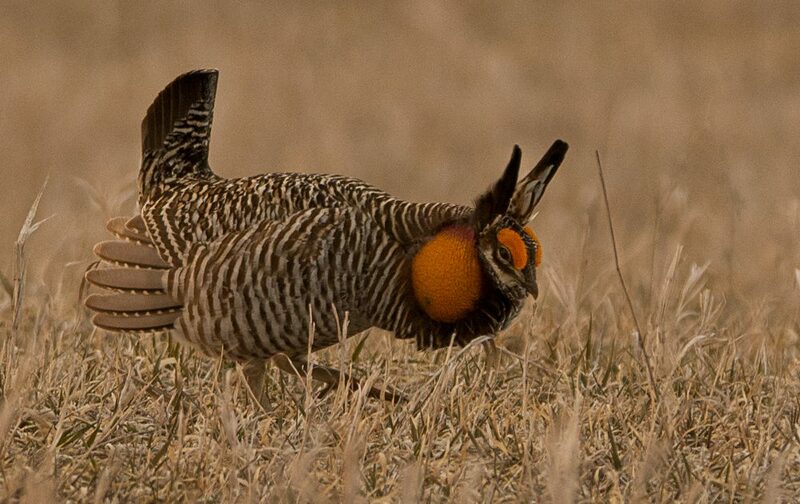 Plan carefully to capture hard-to-find birds, like the Greater Prairie Chicken. Photographed by Ed Konrad in Nebraska. From your experience, what were some unexpected challenges during your Big Year? AK: One unexpected challenge we faced was when we were driving to Florida for the American Flamingo in November. I was driving on a rural road in Georgia, and a large log flew off of an oncoming truck and hit my windshield. It was horrifying…I had 30 surface cuts to my face and was taken by ambulance to a hospital, but thankfully released after treatment. Our car was totaled from the glass damage. But I got right back out there and 2 days went back for the bird and got it! BG: You can get tired by the end of the year, but remember that you’ll complete it just by definition unless something drastic happens. Even with illness and injury, you can keep it going. It’s easier to do a Big Year when it’s local because you’re not killing yourself doing field trips, camping, traveling long distances. TFH: My first challenge was sleeping through the January pelagic trip and missing a couple of birds that wouldn’t show up again for the remainder of the year. A couple of stakeouts were particularly boring. It can also be challenging when you’re hiking through the full summer heat looking for a yellow-billed cuckoo or sitting on a distant island waiting for Lucy’s warbler to show up. Any other words of advice? TFH: Birders are inherently helpful and friendly. Many people like to live vicariously through others’ Big Year journeys and are more than happy to help out. Use this to your advantage to help promote and advance birding. 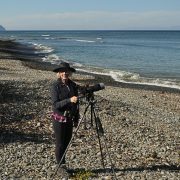 Document your journey on eBird, share your experiences through the local birding listserves (http://birding.aba.org/), or better yet, create a blog and share your own story through blog posts. And remember to pay it forward yourself after it’s all over. BG: One of the things I want to stress is that this is a friendly endeavor. If you find something spectacular, text other people and let them know. Be friendly, be helpful, and don’t be too competitive. Encourage others to participate.